Every year, we dig into all the VBS curriculum, programs, and themes to give you everything you need to know to choose the perfect VBS for your church. It’s a pleasure to dig in and review Group’s Athens VBS because of it’s well-thought out theme and great Bible message. 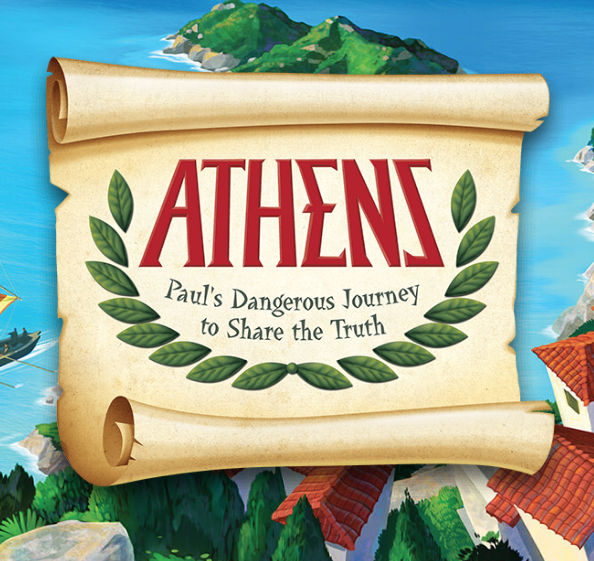 Follow the Apostle Paul on his missionary journey to the ancient Greek city of Athens. 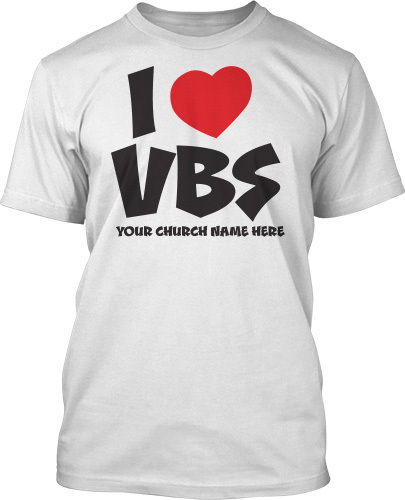 Your VBS kids will thrilled by the true-life adventures Paul experienced traveling the world to tell people about Jesus. Paul left his life of privilege behind to face persecution and danger to spread the life-changing truth of God’s love. Order Athens by Group Publishing VBS HERE. Athens is Group’s “Holy Land Adventure,” a journey back in time to the Athens visited by the Apostle Paul during his missionary journeys. Your kids will hear all about the ancient city and learn how the good news was carried to the ends of the earth. In Athens, your VBS kids will be grouped into “Oikos,” the Greek word for “households,” and will experience Athens’ Marketplace, Arena Games and Paul’s hiding place together. They will start the day with worship and celebration, then meet with their Oikos to see where they’re headed and what they’ll learn. Then, they’ll head to one of the three stations. Before they go to the marketplace, each kid will get three Greek coins to use at different shops. That’s enough to enjoy two activities per day (like pottery, wreath-making, music, rock-painting and more!) and purchase a snack at the food market. Each day during the Bible lessons, your kids will take hold of the Bible point integrated within each activity. For example, on Day 1 tells how Paul began his second missionary journey and rallies the kids to the call, “God loves us all.” On Day 2, kids learn that God loves us and takes care of us just as he did for Paul and Silas. Kids will worry with Paul and Silas on Day 3, but will be encouraged with the fact that God loves us when others don’t. Then on Day 4, Paul proclaims the good news about Jesus to the people in Athens. Likewise, kids learn that God loves us so much that He sent His Son. And then on the last day, Day 5, Paul tell more people about Jesus encouraging kids to share God’s love with everyone. EVANGELISM PRACTICE: Do your kids know how to share the Gospel? Group sought to make this as real of an experience as possible, and in that, give your kids a deep understanding of the need for Jesus in our world. After hearing about and witnessing Paul’s dangerous stories of faith in Paul’s adventures, they’ll get to talk to Paul about what they believe. Then, at the Marketplace, kids will get the opportunity to share their faith with Grecians who believe in false gods. There’s even a shop where they’ll send a Gospel book to kids in India who don’t know that God loves them. They’ll be just like Paul! GOLD METAL MUSIC: Group gives us a mix of modern, scripture-based and on-theme worship for this warm week in Greece. The Yes, It’s True theme song sets the mood for the eye-opening experience ahead, and reminds that God loves them! Love Round follows the same theme, encouraging us to love our neighbor. The CD also features well-known worship songs like Untitled Hymn (Come to Jesus), The Love of God, and Come, Now is the Time to Worship. Kids will be singing straight out of Scripture in We Will Live Forever, based on John 3:16, and He Cares for You, based on 1 Peter 5:7. Your vbs worship will end on a high note with It Was for Freedom, which teaches that true freedom is found in Christ alone. EXTRAS: There may not be anything you can’t get (or make!) at the Athenian Marketplace. 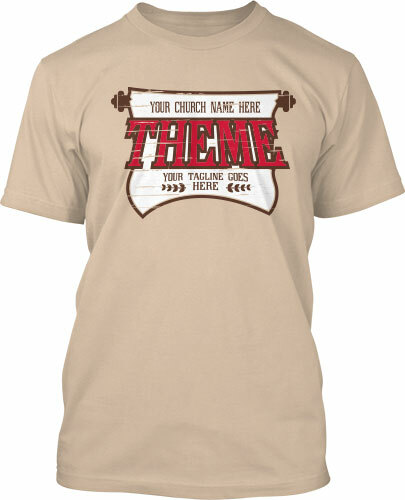 Group provides 10 ideas and crafts which you can choose from depending on your church size! Greek Lyre Kit: Raise the praise the ancient way! Not only is this a fun craft for your marketplace, but it will actually play music! Kids can use it during worship and take it home to enjoy later. Jury Ballot: This craft comes with an important Bible tie-in. In Ancient Greece, “a hollow-peg jury ballot signified ‘not guilty.’” Your VBS kids will make and decorate a necklace with the hollow peg as a wearable reminder of John 3:16. Because of Jesus’s work on the cross, we have been declared innocent in God’s eyes. This is a must-have station for your Marketplace. Order your copy of Athens by Group Publishing VBS HERE. 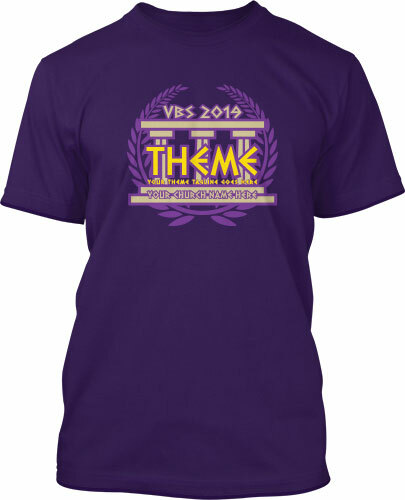 Browse through our t-shirt designs that compliment the Athens VBS theme HERE.